Come see the new look of the Westgate Village Office Center! An exterior renovation was completed recently and includes a new facade, new landscaping and new signage. All of the interior common spaces have also been renovated to compliment the new look. Call us or stop by our on-site management office for more details! 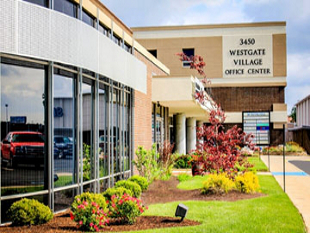 The Westgate Village Office Center is the professional office choice in the Westgate area. 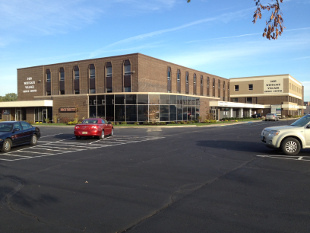 Located across from Costco and next to the former Sears store on Central Avenue just west of Secor and near Executive Parkway, Westgate Village Office is home to a variety of professional service providers such as legal, tax, insurance, title, real estate, marketing, recruitment and staffing, counseling and on-line learning to name a few. Westgate Village Office Center is a natural choice for your office when you require a location that is easily accessible from both east and westbound I-475 and near downtown, hotels, the University of Toledo, shopping and popular restaurants. With patrolled security, free parking, standard utilities, maintenance and janitorial all included in a customized leasing package that fits your needs, you’ll want to visit the Westgate Village Office Center today. 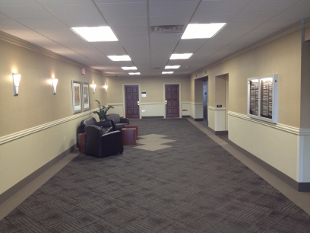 The on-site leasing/management office is located in Suite 114 or call 419-531-7171 to schedule your personalized tour! 3rd floor with skylight and flexible floor plan. Another 2100+ square feet is contiguous for up to 5000+ square feet total. Our full service leasing terms include on-site maintenance and security staff, five (5) night janitorial service, free scheduled use of two conference rooms and standard utilities (heat, air, lights and outlets). Both AT&T and Buckeye Cable/High Speed Internet/Fiber provide service to the building. Our management offices are on-site, which allows us to be quick responders to your needs. You’ll find all the things required to conduct business quickly… on-site banking, postal, UPS and Fed-Ex drop boxes. You can choose from multiple sizes and space configurations ranging from the single office to approximately 5000 square feet. Build-to-suit opportunities are also available to design exactly what your business needs. Also, just a short walk away are popular restaurants such as Five Guys, Chipotle, Jamba Juice, Barry Bagels and Starbucks. Piada’s Italian Street Food, WingStop, Fuzzy Tacos and Blaze Pizza are serving lunch and dinner in our North Center. SportClips is NOW open specializing in great cuts for both men and women who love sports. Within Westgate Village, you can get gas at Costco, shop Fresh Market and Rite Aid and be good to yourself by booking a massage, yoga or wellness classes. Don’t wait any longer, call us today at 419-531-7171!